These delicate earrings were designed by Kris Nations, who only uses recycled metals in her designs. They are 14kt. 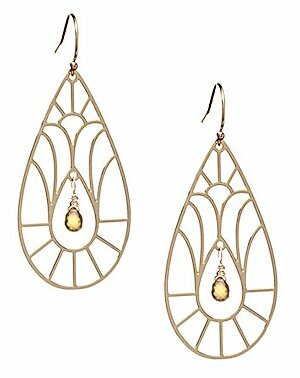 gold-fill and plate and feature an open teardrop design with genuine faceted citrine briolette dangles at their center, and were made in the USA. Please note that earrings are non returnable. Guaranteed authentic, 1 available.